Dr. Megha Mittal did her M.Sc., Chemistry from Jiwaji University and Ph.D. from Defence R & D Establishment, Gwalior. She has over 13 years of experience including research, academics and industry. She qualified CSIR-SRF and worked as Senior Research Fellow at Defence R&D Establishment Gwalior. She completed various projects based on heavy metal toxicity and heavy metal remediation funded by CSIR, AYUSH, DRDE and MRCE. Dr. Mittal has 33 research papers in peer reviewed International and National journals and 3 Book Chapters in Elsevier and Royal Society of Chemistry Publications. Dr. Mittal joined MRU (Ernst while Manav Rachna College of Engg) as Assistant Professor in January 2011 and currently working as Head, Department of Chemistry. She is also handling additional responsibility as Coordinator, Doctoral Programs, MRU. She is certified Analytical Chemist and certified trainer for GLP (Good Laboratory Practices) by WHO and UNDP. 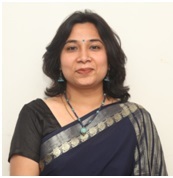 She is Member Editorial Board and Advisory Board of various International Journals such as Journal of Environmental Biology, Oxidants and Antioxidants in Medical Science, BMC Complementary and Alternative Medicine, Free Radicals and Antioxidants etc. She has Mission 10X Learning Approach Practitioner Certificate to her credits. Her current research interests are: Green Chemistry, Water Detoxification by Nano- Green and Biochemical Approach and mechanism of bio-molecules generation under stress conditions.